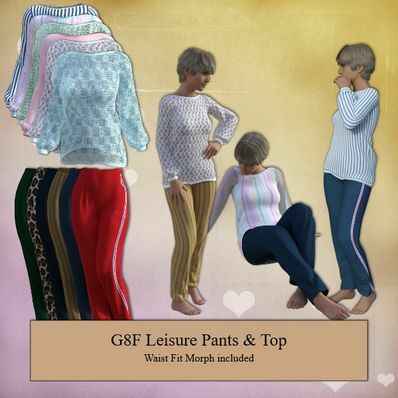 Leisure Pants & Top for Genesis 8 Female for use in Daz Studio 4.8. Waist Fit included. I have also included several Textures. Wonderful Set. Thank you so much! Many, many thanks for all your fine clothes. I wish you a happy new year. Nice looking outfit. Thank you! Your clothes are always wonderful!! Bravo and thank you very much! This set is fantastic. Very good work. Can you tell me with which software you created the clothes. Thank you. These look so relaxing and casual, so natural, something you don't really see at DAZ 3D or Renderosity unfortunately. Mostly scantily clad ladies wearing hardly anything at all. I so appreciate your modesty in the clothing you create!!! Thank you so much!!! Really nice outfit Wendy! I'd like that myself for every day errands! Perfect for lounging around! Thank you so much for sharing!! Thanks so much Wendy for creating and sharing this very sweet set of pants & tops.